The You Woman Group is reuniting for the first time since 2008! 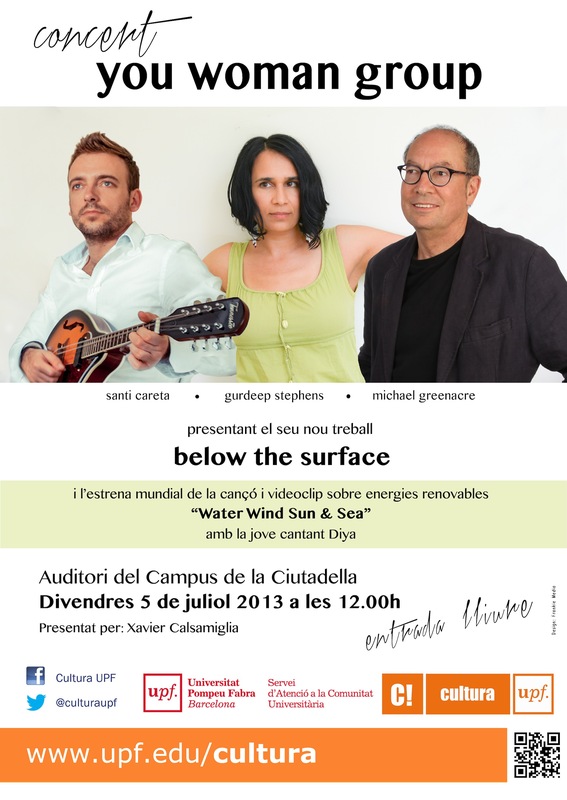 We are giving a concert in Barcelona on July 5th playing music from our new CD, “Below the Surface” The album will be released in December and features the original songs of Michael Greenacre and the guitar of Santi Careta. “Below the Surface” continued in the vein of the original ‘you, woman’ album from 1999. Special guest is singer Karol Green. Xavier Calsamiglia, grandson of Catalan composer Manel Blancafort will introduce us. This event is sponsored by the Universitat Pompeu Fabra in Barcelona Spain. Pompeu Fabra is one of the top Universities in Europe and certainly the leading Spanish university. We will also be performing ‘Water Wind Sun and Sea’ for the first time ever, debuting Diya who sings and stars in the videoclip. This videoclip of “Water Wind Sun and Sea” will be shown for the first time as well. This song and video aims to promote sustainable energy. At a time where the Canadian government hands subsidies of a billion dollars to Big Oil, why not take that money and invest it in clean energy? A statistician, Michael has worked with scientists and biologists on climate change. This inspired the song. The fossil fuels that are burned go straight in to the ocean as the ocean is the world’s largest carbon “sink”. This causes acidification of the water and is destroying ocean life at the fastest rate since the last mass extinction. Let’s harness that energy, let’s sing and dance and encourage us all and our governments to invest the big bucks in clean energy and infrastructure. We know the answer, we know the solution to climate change. We will make it happen. Together. If you book your travel now, you could still make it with time to spare! This entry was posted in Great Events, Music, Uncategorized and tagged Below the Surface, concert, Diya, July 5 2013, Karol Green, live concert, Manel Blancafort. Catalan, Michael Greenacre, new CD, Pompeu Fabra, Santi Careta, song performance, Spain, Universitat Pompeu Fabra, Videoclip, Water Wind Sun and Sea, Xavier Calsamiglia, you woman, You Woman Group on July 2, 2013 by Gurdeep Stephens.